We concluded our State Cup tournament in Kansas this week. Each state holds it’s own competition for U13 to U19 teams. 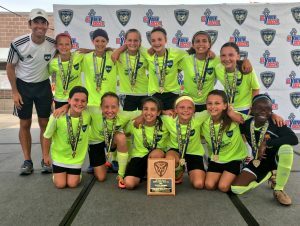 The winner of each age group advances to one of four different regional championships where the winners earn the right to attend the US Youth Soccer National Championship. This is one of my favorite times of the soccer year because it showcases everything that the teams have learned. The competition between the best teams in each age group brings out the best in everyone. Win or lose it’s a great way to finish a great year with your team. I give Joel my suggestions for the best ways to format his sessions to maximize the fun and development of the players and make it easy to manage a larger group of players. I’m discussing the most common soccer injury issues with Dr. David Geier. These are issues that every coach and parent should be aware of. Keeping our players safe and healthy insures that they’ll be able to maximize their development and enjoyment of the game for a lifetime. Here’s a link to the PEP Conditioning program that Dr. Geier recommends. I’ll discuss the importance of training your players at game speed and when you should slow it down. luv the pod but i laughed for a long time when your guest suggested another sport that doesnt tax the lower body. Swimming was a great choice, baseball aint gonna happen because kids want to move but basketball? Really? Basketball is harder on the ankles, knees, hips and back than soccer. That was just wrong. As someone who has played/coached both soccer and basketball for over 3decades, I couldnt believe that anyone familiar with the game thought this made sense. I IMed almost two dozen people who have experience in basketball and most answers came back with questions marks and exclamation points galore. As someone whose kids play soccer, judo (even harder on the ankles) and basketball, Ive tried to get them into something less lower body oriented and its hard to find (swimming is really the best because the boyancy means less stress). Tennis on hard courts is brutal on knees/ankles.Team Handball just as bad as basketball. Cycling isnt bad but not a competition sport at lower levels. Besides, my kids spend their summers outside (they have tablet/video games time limits in case you wonder how I manage that) playing… soccer and basketball with their friends. Not having the 2Xweek practices + game, wouldnt change much (they only play 1/2 or 2/3 of games and the technical parts of training arent hard on the joints.) in how much wear and tear on their bodies. Once my eldest turned 15, we added controlled weight training (no direct pressure on spine like back squats, shoulder presses, standing calf raises) to bring the upper body to the levels of the legs. We also try to go and play pingpong once a week in winter (same place as the pool) because its less hard on joints than tennis and badminton but is great for coordination. A close toopis that Id like to hear more about: secondary sports that kids should play for fun, variety and help their soccer. Every parent of athletic kids have been through the same routine starting around 9-10 when they play two sports: they are told nicely that their son is really good in sport A and it would be better for their progress if they concentrated on that sport. Then eventually they are told the same by sport B organizers. I think cross training sports helps build different motor skills, prevents burning out in one sport and can help perform better in soccer. Even though Im not a tennis player, I have seen over the past decade a least a dozen kids, usually the chubbier kids or the ones with bad footwork, show up one year and they look and move totally differently and wehn I ask the parents what they did, the answer is tennis. its amazing how not even a year of tennis can improve the movement (especially players who run in linear fashion like ice hockey players tend to) and footwork. Ive seen it enough times to be a big believer. I also tell parents to put their kids when they are realy young into judo if just for a year because the first thing you learn in judo as a kid is how to fall which is something you do a lot in sports like soccer. Since our club is located in a neighborhood that has the biggest ludo club in canada (460+members), there are many kids that do both sports and I can always tell the judo kids by how they fall and roll, not to mention the added benefit of better balance. Just learning how not to hurt yourself when hitting the deck can save a lot of pain later in life. Basketball/handball while hard on the lower body help kids deal with body to body contact, how to move and cut sharply and improves their footwork and coordination. I think kids should be encouraged to try out for more than one sport because it not only can benefit their game but also adding variety will make them a more rounder athlete-person and will prevent them from being burned out by soccer by the time they hit their teens (when you lose a looooooot of players already because of other commitments, girls, part time jobs,etc). Every time I hear those pressure stories about how a child should drop another sport, I tell the parents that YOU decide whats best for your child, not the soccer or basketball coach who thinks that THEIR sport is the only thing that matters in life. of course you have to be careful about overtraining but Ill get back on that another time with how horribly overtrained elite players are in our neck of the woods. I didn’t see the link for the exercises Dr. Grier was talking about.